"Don't be afraid of who you are." Those simple words of advice from a friend launched recording artist Jonathan Pierce on a personal journey of self-discovery that would culminate in For You, his bold and innovative fourth release. Three years in the making, For You clearly stands apart as a daring leap forward for its artist. From its sparkling, creative pop sound and lush production to its lyrics that alternately challenge and encourage, For You shows us a Jonathan Pierce who has finally grown up-creatively and personally. "The goal of these songs is to get people to realize that they have a destiny. But in order to find it, we have to take a look at our life and deal with the issues in our past. Then we can take hold of the future," Pierce declares. Indeed, Pierce's own creative evolution has its roots in just such a process. First arriving on the scene in 1995, Jonathan Pierce released three albums in five years, earning a reputation as a power singer along the way. His albums yielded a string of radio hits ("One Love," "Healing Hands," "I Believe In Christ") and multiple Dove Award nominations, including Male Vocalist of the Year from 1997-1999. His authoritative vocals and boyish good looks opened other doors, as well: Pierce nabbed the starring role in the touring production of Broadway's "Joseph & The Amazing Technicolor Dreamcoat" and was a featured performer at numerous Peter Lowe Success Seminars, where he shared the stage with the likes of Margaret Thatcher, Christopher Reeve, and George and Barbara Bush. By the summer of 2000, Pierce seemed to have it all. Inside, however, he was at a creative crossroads. "By industry standards, I was successful; Comparisons were made to all the big power singers. But I was miserable, absolutely miserable," he reveals. "I was so uncomfortable, so frustrated with myself. I thought, I've become a poser! Someone who just stands up at the microphone, makes my point, and leaves. I could hide behind the voice, when there was so much more that I really wanted to become." Pierce realized a change was long overdue. So he pulled off the road and embarked on an extended hiatus, breaking from his professional relationships while he sorted out his own goals and ambitions. "When I went on this new journey, I knew who I was, but I wanted to change. I wanted to say, Okay, this is what we're going to fix. And that means getting past childhood failures, getting past words and names and things that people had labeled me with," he says. "When I came to terms with all that, I realized God had something just for me that's different. It's not a copy, it's not a reproduction, but it's an original." Pierce emerged from his time off with a new determination and a fresh creative direction. A self-described late-bloomer, Pierce observes that in the past, he'd always taken the safe approach where his music was concerned. Now, he was determined to start over, with an eye to taking his music and message around the world. To that end, Pierce has forged new alliances and found new creative mentors to help him shape the bold sound unveiled on For You. Among the producers Pierce brought on board this time around are Brian Rawling (Cher, Whitney Houston, Enrique Iglesias, Rod Stewart); Billy Mann (Jessica Simpson, Kelly Rowland, Hall & Oates); and country music recording artist Paul Brandt. "They taught me that I can influence and infuse culture subtly, to make the most impact," Pierce notes of the new team. "And that's what this record deals with." The result is a sound Pierce describes as a "different kind of international-meets-Miami-meets-New York-meets-L.A.-and maybe a bit of Nashville thrown in. I wanted it to feel different." Indeed it does. First single "You're Still The Love Of My Life," co-written by pop superstar Michael Bolton and producer Mann, bears Pierce's trademark emphatic vocal performance, but its Latin strings and electronic flourishes are altogether something different. Soul-stirring uptempo numbers like "Serendipity," "Life, Love & Happiness," and the Sting-penned "Let Your Soul Be Your Pilot" offer some lyric meat along with the pop grooves: urging listeners to examine their lives, take stock of their relationships, and go for their dreams, the message is nonetheless delivered with an infectious dance beat and pulsing pop groove. Pierce dedicates "Love Will Happen" to Mercy Ministries of America, a non-profit group that assists young women challenged by abuse, addiction, pregnancy and eating disorders. "The song talks about a girl that feels that she's lost everything, that everyone has dumped on her," he explains. "These girls come into Mercy and some have been abused by those they should have trusted the most; people of authority, even their own family members or they find themselves pregnant. They have eating disorders because the culture says you must be skinny. I'm around them and I think, what happened? Hopefully the music will build a bridge." An accomplished songwriter in his own right, Pierce also wrote three tracks on For You, including the vivacious "Go In Peace" and the powerful ballad "Run To You." In keeping with the album's relational theme, Pierce's compositions were inspired by those he calls his personal heroes: his wife of nine years, Denise; his mother, who is battling cancer; his friends, and his church home. "I could not have made all these changes in my life were it not for them. And no one has impacted my life like my wife. It's been very difficult to wrestle with this stuff, but she would intercede for me when I couldn't for myself. She has always been there for me. And man, we have battled storms! But we've lived to tell about it." The couple live outside Nashville, Tennessee in a home filled with Asian antiques and art from around the world. It reflects another obsession of Pierce's: interior design. Long a "closet designer," Pierce once filled the days between concert dates by designing homes for some of Nashville's most notable families. 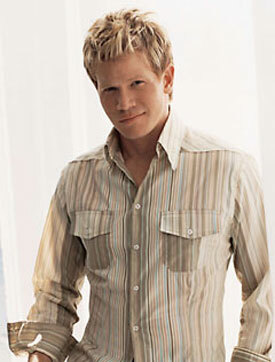 In early 2003 his two creative passions merged when he was selected lead designer for CMT's Ultimate Country Home series. Pierce guided such country stars as Deana Carter, Lonestar, and Brad Paisley in designing a 3,650-square-foot house over the course of 13 episodes. Pierce had never actively publicized his work as a designer, but the timing couldn't have been better. Wrestling at the time with his own artistic demons, wanting to stretch himself creatively yet afraid to do so, the CMT opportunity forced Pierce to take a hard look at his insecurities. That's when Pierce received those seven words of advice from friend and pastor Rice Brooks: "Don't be afraid of who you are." "It was the greatest advice that changed everything," Pierce reflects. "He said, God gave you distinctive gifts, distinctive dreams, and distinctive ambitions. Do not let the words of the world define you. You were stamped to be creative: take it and run with it." With For You, Pierce plans to do just that.